Burdock, which has the scientific name of Arctium lappa, is a member of the Asteraceae family and the genus Actum. It grows in a biennial manner and is endemic to North Europe and Siberia. There are certain reports, however, that burdock, belongs to the sunflower or Compositae family. It is also called beggar’s button, thorny burr, gypsy rhubarb, burs, hurrburr, gypsy rhubarb, hardock, cockle-button, lappa, gobo, love leaves, happy major, clotbur, harlock, harebur, fox’s clot, personata, stick button, and bat weed, among others. Burdock thrives in cool climates and well-drained sandy loam. It reaches a height of 100 to 300 centimeters. 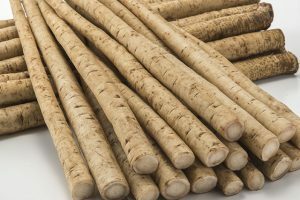 Its roots are colored brown while its flesh is white-colored and has a sweet and mild flavor that is similar to the taste of Jerusalem artichokes, parsnips, and scorzonera. It flowers best between the months of July and September. Burdock is good for the liver. It activates enzymes that stimulate bile production and the proliferation of bile juices in the gut, which helps the liver speed up the process of flushing out toxins from its system. Since clearing toxins in the blood is one of the liver’s main functions, burdock also indirectly is good for cleaning the blood. It also prevents people from getting anemia. Due to its fiber content, burdock can control the balance of insulin and glucose within the body, thereby staving off the onset of diabetes. Poor eating habits, improper bowel movements, and high levels of toxic substances in the blood cause the influx of acne or discoloration, pimples, rashes, and skin inflammation. Ingesting burdock roots via herbal teas can help pave the way for a clearer, smoother skin. Burdock has diaphoretic and diuretic properties. It induces the production of sweat and urine. It also is good for expectant mothers and prevents defects in newborn babies. It also treats back pain and cramps, and it is good for oral health. Burdock is good for the nervous system. Its vitamin B6 content – which is more than a tenth of the recommended daily intake for vitamin B6 – provides for the healthy functioning of the brain. It also helps the process of hormone production for regulating your internal clock and mood. As such, burdock root aids in alleviating the symptoms of premenstrual syndrome among women. Vitamin B6 also lowers the amount of homocysteine in the body. Homocysteine is an amino acid that eliminates cells in the arteries, thereby upping the chances of cardiovascular ailment development. Vitamin B6 also addresses inflammation issues such as rheumatoid arthritis and osteoarthritis. Burdock is good for the immune system. Burdock’s vitamins C and E content perform the job of antioxidants in neutralizing free radicals that cause premature aging and the growth and proliferation of carcinogenic cells. These antioxidants also prevent the onset of infection, support cellular and muscular functions of the body, and facilitate repair of damaged cells and tissues in the body. Burdock is good for lowering cholesterol levels and thereby, the cardiovascular system. Because of its high potassium content, burdock has the ability to relax blood vessels and arteries, thus reducing the risk of atherosclerosis, heart attacks, and strokes. Burdock is good for the digestive system. Eating burdock can help facilitate the movement of food easily through the bowels, thus lessening instances of constipation, ulcers, bloating, and cramping. Burdock also reduces inflammation in the gut and get rid of harmful bacteria that cause diarrhea and other gastrointestinal issues. Burdock roots can be tasty and appetizing, espeically when used in a salad. Here is a salad recipe for burdock. Burdock is good for the immune, cardiovascular, digestive, and nervous systems. Burdock is good for the liver. Burdock can control the balance of insulin and glucose within the body.